The Dow was able to notch another record high Tuesday, but the broader market was mixed as investors weighed the latest corporate results against a weak regional manufacturing report. 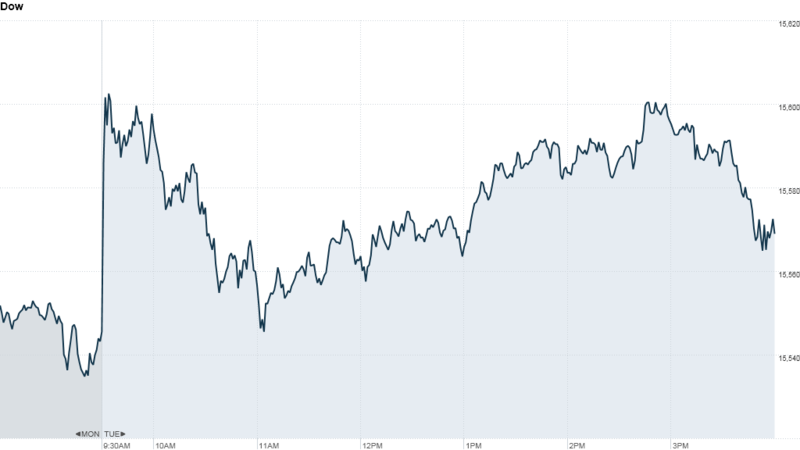 The Dow Jones industrial average gained nearly 0.2%, ending at an all-time high of 15,568. The S&P 500 fell 0.2%, after earlier touching a new record high and coming within a few points of 1,700. The Nasdaq fell 0.6%. Stocks opened broadly higher as investors focused on solid corporate reports, but the momentum faded after an index of June manufacturing activity from the Federal Reserve Bank of Richmond plunged 11 points. After a pullback in June, stocks have resumed their march higher this month. So far this year, the major indexes are all up about 19%. Stocks are being underpinned by expectations that the Federal Reserve will continue to keep the market awash in liquidity, said Doug Roberts, chief market strategist at Channel Capital Research. Fed chairman Ben Bernanke told lawmakers last week that there is no "preset course" for the central bank's $85 billion-per-month bond buying program. "Bernanke is the 900 lb. gorilla in the room," said Roberts. "As long as he keeps pumping money, then the risk trade is still in effect." Earnings parade: Nearly 160 companies in the S&P 500 are slated to report quarterly results this week. So far, the bulk of the reports have matched or topped analysts' low expectations. "Earnings will continue to dominate the news the next two weeks," said David Brown, chief market strategist at Sabrient Systems. He said weak results last week from Microsoft (MSFT), Google (GOOG) and Intel (INTC) have "put a pox on the technology sector." Apple (AAPL) bucked the trend. After the market closed, Apple said it earned $6.9 billion, or $7.47 per share, on sales of $35.3 billion in the company's third quarter. Compared with last year, earnings were down nearly 20%. Still, Apple's results were better than expected. Analysts had predicted earnings of $7.32 and $35 billion in revenue, according to estimates from Thomson Reuters. Apple shares gained about 0.5% in extended trading after ending the day down 1.7%. Also after the market closed, AT&T (T) reported earnings that missed estimates by one penny. Shares edged lower. Among the companies that reported Tuesday morning, earnings were better than feared, but revenue growth was generally tepid. 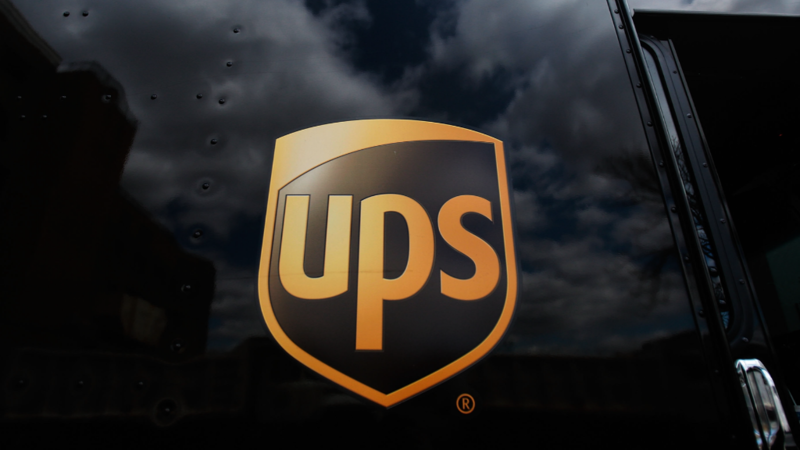 UPS (UPS) reported earnings in line with its preliminary expectations. The packing and shipping company said volume in the U.S. and internationally grew, even as revenue came in slightly below forecasts. Shares of United Technologies (UTX) were up after the aerospace supplier raised its earnings outlook for the year. DuPont (DD) reported earnings that beat forecasts but revenue fell short, which the company blamed on slipping chemical sales and economic headwinds in Europe and Asia. Travelers (TRV) reported a boost in quarterly profit, citing "lower catastrophe losses." Texas Instruments (TXN) shares rose after the semiconductor maker reported quarterly earnings that came in ahead of expectations. Lockheed Martin (LMT) said net income rose 10% in the second quarter, despite a 4% drop in revenue. Wendy's (WEN) reported better-than-expected earnings and announced plans to sell 425 company-owned restaurants. Netflix (NFLX) shares sank one day after the streaming-video service added fewer subscribers than expected in the second quarter. Shares of TheStreet (TST) briefly rose above $2 after CNNMoney reported that private equity firm Spear Point is pushing for a sale of the company, and has positioned itself as a bidder. World markets: European markets reversed course late in the day and ended lower, while Asian markets ended with gains.